New contracts do require a deposit. We no longer accept checks for backyard or house shows. Fire shows prices can run $150-$1200 depending on length, venue and number of dancers. The more dancers, the more of an exciting show! incase of rain out we can do indoor LED shows, bellydance or hula shows. Certain hotels and certain public venues may require a fire permit. Please be sure to inquire/ obtain any special events or fire permits if applicable. Fire Insurance Certificates are available upon request. 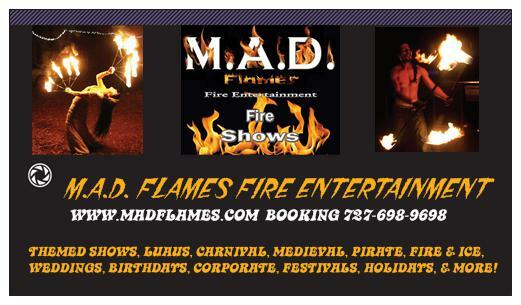 MAD Flames is based out of Pinellas County but we are available to travel to Pasco, Hernando, Manatee counties (Travel fee may be added ) Don't forget to tip your dancers if you enjoyed the show!